I’ve just finished a lecture tour of Australia on Bitcoin. I’ve been working on currency innovation since 2010, but it’s the rise of Bitcoin that has generated far greater attention, with my recent lectures even making national news. But Bitcoin is only a small part of the story. There are now over 140 adaptations or forks of the Bitcoin open source code to create new “coins.” Every week new ones are released. Some appear to be interesting innovations, some seem more like get-rich-quick schemes, and others may even aim at debunking the whole idea of cryptographic currency. The recent BBC article on a coin idea that would borrow rap star Kanye West’s name does seem like an attempt to lampoon this area of innovation, as there is no news value in that one idea amongst over 140 cryptographic currencies. Currency innovation is so important to the future of not only money and finance, but the economies and societies currently shaped by our existing unfair monetary system (if you want to know why, read my chapter with Tom Greco). We need crypto to grow and propel reform of our fractional reserve banking system. That’s why the famous monetary critic Bill Still has become so enthusiastic about this field of innovation, and why we should applaud him for that bold move, while most monetary critics think more conferences and letters to politicians will achieve a change. Below I will list some substantive drawbacks of bitcoin that have been mentioned by commentators, so that its clear where I think innovations are needed. Then I’ll examine one new crypto that made news by gaining the backing of a famous monetary system critic, Bill Still. I’ll conclude with some suggestions as to where I think the best innovations are, including many projects that have been building slowly and away from the limelight brought by wild speculation. Computing power rules – The majority of miners choose upgrades to the software, whether or not all agree: perhaps best but not always? Also 51% control would allow double spend. Internet dependency – A problem when phone lines are down. Disruptions Ahead – The monetary system needs reform and replacement but the way this is done will have wider effects on Government finances and personal savings, so a lack of good response by Government to prepare society and economy for the changes would be a problem. With these limitations in mind I’ve been observing the innovations in crypto throughout 2013. One that made the news is Quark, by being backed by the leading monetary critic Bill Still who then talked about it on Max Keiser’s popular TV show. I rate these people, so bought some Quark very early on, despite there being no detailed technical specification. However, as I looked closer, I realised that Quark isn’t effectively addressing the limitations of bitcoin. As such it is a good case study for how this field now needs much better analysis and impartial advice. Let’s look closer at their claims. Quark and Bill Still have claimed it is better than bitcoin due to more encryption than bitcoin. First, I had come across no one saying the level of encryption of transactions in bitcoin is insufficient, partly because the decryption process is about making “mining” more difficult rather than securing transactions. Second, for the reasons given in a detailed Bitcoin Magazine article, more encryption does not appear to make quark more secure, and from my internet searches I haven’t seen quark’s tech respond to that specialist critique (I’m not a cryptographers so can’t conclude but an absence of response is not promising). Third, the encryption works for processing blocks on the block chain, rather, not making transactions secret, as everything is published on the blockchain, so more encryption has nothing to do with avoiding surveillance. The coin Anoncoin claims to enable more anonymity but upon inspection I find that it doesn’t offer anonymity on the blockchain, so at present the only way to do this would be to download TOR and mask your IP address when browsing the web to download a wallet onto your computer. However, becoming active in transactions would reveal your ID. Using cloud provided wallets, such as www.blockchain.info, which can be safer for large holdings of crypto than just having it on your own computer, is also not anonymous. Selling your cryptos for national currencies through an exchange is also not anonymous. More work needs to be done on anonymity if this is a goal. Quark and Bill Still have claimed it is better than bitcoin due to speed. The slowing down of bitcoin transaction confirmation time is a significant issue. Nearly all forks of bitcoin should be faster than bitcoin as the blockchain is smaller, there are less transactions to compute, and there are less hard computer problems to crack for a “mining” computer to be able to complete a block of transactions (if a close fork, which means that the difficulty of decryption grows over time). This will change once a currency becomes widely used, unless dealing with this future size is built into the design. Quark suggests it has, by seeking 30 second transaction times. Yet if reaching the same amount of transactions as bitcoin, e.g. 80,000 a day, it’s unclear to me how quark would be faster, as quark requires more decryption to take place. In addition, the analysis in Bitcoin Magazine suggests this speed of transaction increases the likelihood of mistakes being made in the blockchain. Litecoin is currently functioning with swifter processing times than bitcoin and without creating new weaknesses, but this speed-at-scale issue appears to need additional design innovations to overcome. Peercoin claims to attempt a solution by employing a proof of stake model for mining rather than only a proof of work model. This also promises the benefit of less computing power to be used to run massive amounts of meaningless decryption. I am not a cryptographer so I don’t know the veracity of these claims and await a technical challenge to them. I also question whether a proof of stake model could benefit those with large holdings. Therefore more work needs to be done on speed issues, and some of that work is being done on bitcoin itself, or with platforms that base themselves on bitcoin but offer additional payment mechanisms, such as pikapay, where you can send bitcoin via twitter. Others are starting from scratch with new code to attempt a solution, e.g. Nextcoin. Im not able to say whether nextcoin is better yet, as it is still being designed, but it appears a serious attempt to address these limitations, rather than a quick-to-market fork of bitcoin. Quark and Bill Still have claimed it is better due to being more distributed. I’m not sure what they mean by this. As the Bitcoin magazine explains, most Quark had already been issued within 3 weeks. This means extremely high concentration in the hands of a few – the inventors, friends, early adopters and spokespeople. Bitcoin is highly unequally distributed, and quark’s form of issuance makes this problem worse, not better. Quark does not incentivise mining, as so few quark are mineable now, so the fact that quark mining is not dominated by specialists like bitcoin is an irrelevant and misleading argument. If the early adopters of quark cash out and sell their quark then this may increase distribution, but the key is whether a currency is designed well for distribution. The problem of issuance is one that Freicoin have sought to address right from the start, by seeking social organisations to receive donations of freicoin. It is early days for the project, but it appears a genuine attempt to deal with two of the design problems with bitcoin that I list above. They address the issue of bitcoin being asset-like and deflationary by adding demurrage into the design, based on the ideas of Silvio Gesell (1918) and the experiment in the Austrian town of Worgl in the late 1920s. They are also sought to address the problem of unfair issuance. The developers contacted me in 2012 to discuss design issues around demurrage, and I had the sense it has been a well worked project. Bill Still claimed on the Keiser Report on RT.com that quark will be less volatile in price due to being more distributed. The volatility of bitcoin is a problem. It’s the speculation, lack of day to day users, and lack of backing in the form of acceptance as tax, that enables such volatility. Interestingly the speculation around bitcoin is what brought it to global attention and has driven adoption, so could eventually help reduce the volatility. Quark is much less used as a means of payment than bitcoin and is much more concentrated/unequal in its ownership, therefore it is likely to be more volatile not less. The bitcoin millionaires would do well to begin systematic philanthropy to give bitcoin to social projects that commit to spend the bitcoin as bitcoin, rather than cash out, and therefore spread the usage of bitcoin to more users and reduce the volatility that arises to large transactions by a few (the average value of a bitcoin transaction is about 3000 dollars at present). Quark is an interesting case study because it highlights how the world of crypto is all about impressions. Celebrity endorsement and buzz is extra powerful in the absence of any agreed standards, codes, professional institutes and qualifications, or related regulations. This is especially so in an area that is so new to most people and where understanding it requires some knowledge of currency design and computing, so most people just accept other “expert” sources. I consider myself a currency sociologist, so I will never be able or interested in delving deep into the code of a crypto. However, one can assess the logic of any arguments made and when grand claims are made then look for dissenting opinions. Yet as this field grows it is clear we will need to professionalise. It’s currently a Wild West of currency innovation, where jokecoins and quackcoins all attract attention and funds and their proponents to fire off at each other will not lead to a positive social and economic outcome unless there are more forums for understanding. I fear that in the future we will hear of scams that fleece pensioners of thousands of their savings on crypto currencies. We must do what we can to reduce the risks. We can help shape a responsible and professional field of currency innovation. That is why it is important to see how groups like the Bitcoin Foundation evolve as well as the new self-regulatory initiative called the Digital Asset Transfer Authority. I come at this issue from a background in sustainable development and local currency innovation, such as the mutual credit system in Kenya that helps poor entrepreneurs trade without money. As such, I’m not that excited about crypto currencies as they do not enable us to issue credit to each other, and maintain the delusion that money is a thing of value, rather than a means of exchanging things of real value, like our time, skills, produce, and land. That’s why, in the crypto space, I’m most interested in Ripple. I’m not interested in their XRP currency, but in the payment infrastructure it creates whereby each of us can create credit for people we trust and therefore credit can flow through a network. If you don’t trust me for 20 dollars but you trust Paul for 20 dollars, and Paul trusts me for 20 dollars, you can post me that 20 dollar book and Paul goes negative to you by 20 dollars but up 20 dollars to me, and I go down 20 dollars to Paul. No dollars may need to change hands because in a network of thousands, these positive and negative balances can be cancelled out. Or in other words, you can use your 20 dollars credit from Paul to buy something else. Therefore the availability of currency does not limit what we do for each other, unlike the current national currency models or the asset-like crypto currency models. People who criticise Ripple as a debt model don’t understand currency theory or monetary history, and that debt is the origin of money, whereas asset currencies, like gold, were used originally by armies not communities. Compound interest is the problem not debt, the control of debt creation by the few (i.e. private banks) is the problem, not debt. Instead, we need to reclaim the credit commons, the ability to issue credit to each other, as I explained in my keynote to the Berlin conference on the commons last year, and as we discussed after with Michel Bauwens. There are some concerns around how Ripple is now controlled by one company, and how the XRP system will relate to the credit clearing system, so more work needs to be done on this space. For the socially minded, who want to make currencies serve humanity, not the other way round, then the most exciting currency innovation right now is the partnership between Jnana and Community Exchange Systems. They have received funding from a state Government in Australia to upgrade and open source the software that hundreds of local level community currencies use worldwide. These are mutual credit systems, that use currencies like hours. No one gets rich on such systems, they simply enable communities to trade more and help each other more. Once such systems use the latest technology and can interoperate with each other, then we will see a new monetary system that is attuned to the needs of communities, resembling those that existing before armies and empires imposed precious metals as our means of exchange. This, friends, is our coming freedom in the 21st century. Meanwhile I hope more people who work in this complementary currency space, hitherto working at local level, become more sophisticated in their understanding of cryptographic currencies and begin to influence its evolution in ways that could then better serve society. At the moment many who work on local pounds or timebanks or Local Exchange Trading Systems simply dismiss cryptographic currencies as involving people with no community intention. Yet the combination of crypto approaches and community approaches could be truly powerful. The need to improve understanding in this broad field is why at our Institute we have launched a Masters-level “Certificate of Achievement in Sustainable Exchange” which will explore currency innovation in the context of monetary theory, the sharing economy and sustainable development. We are even offering scholarships. 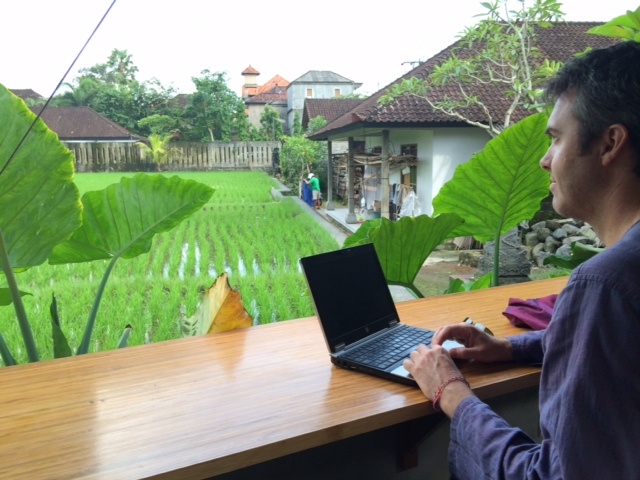 I wrote this post after my talk on current innovation at www.hubud.org in Bali, while sipping on my tumeric juice.